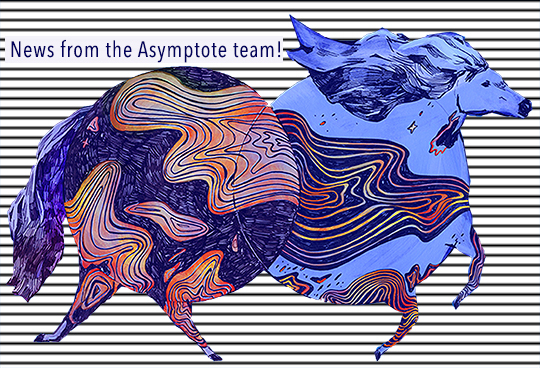 Check in with the Asymptote crew's literary achievements! Poetry Editor Aditi Machado published a micro-review of Hirato Renkichi’s Spiral Staircase (translated by Sho Sugita) in The Kenyon Review. Copy-editor Anna Aresi‘s Italian translation of Ewa Chrusciel’s poems from her new book, Of Annunciations (Omnidawn, 2017), appeared in El Ghibli, the first Italian journal of migrant literature. Assistant Blog Editor David Smith presented original research on the life and work of Sherman Adams (an African-American activist, journalist, and author who migrated to Sweden in the 1960s) at the Lost Southern Voices festival in Atlanta on March 24. He will also be reading a paper at the Society for the Advancement of Scandinavian Studies conference in Los Angeles in May.